Orlando – Sunshine. Whimsy. Tacos. 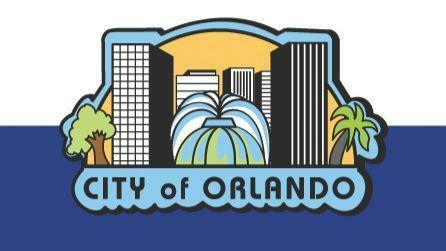 July 31st, 2017 is Orlando’s 142nd birthday. 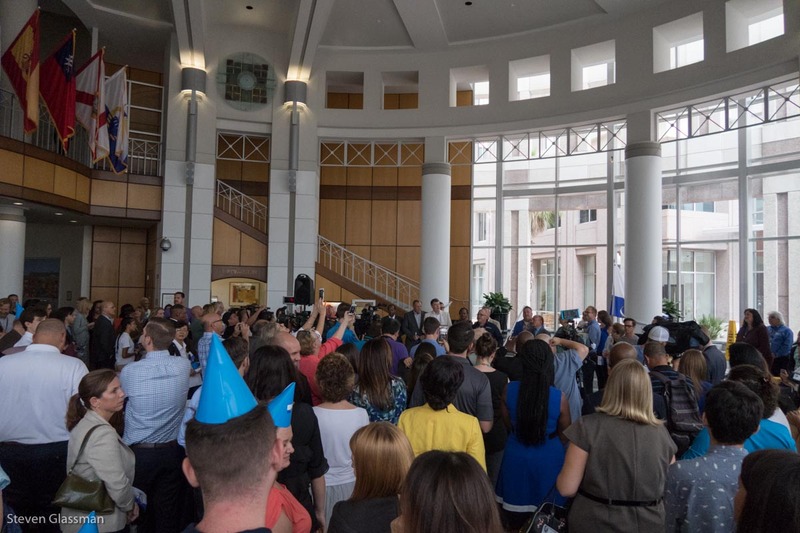 To celebrate the birthday, there was a celebration today at City Hall. With a big birthday cake. 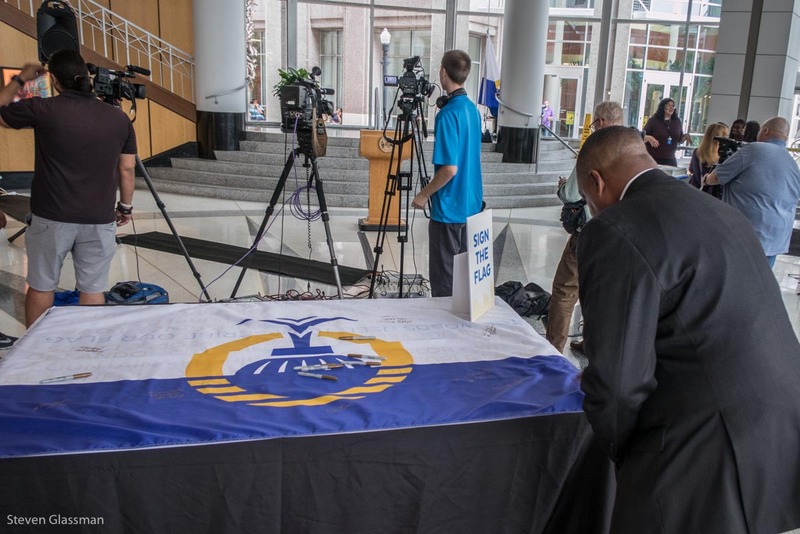 Also, today was the raising of the brand new city flag. 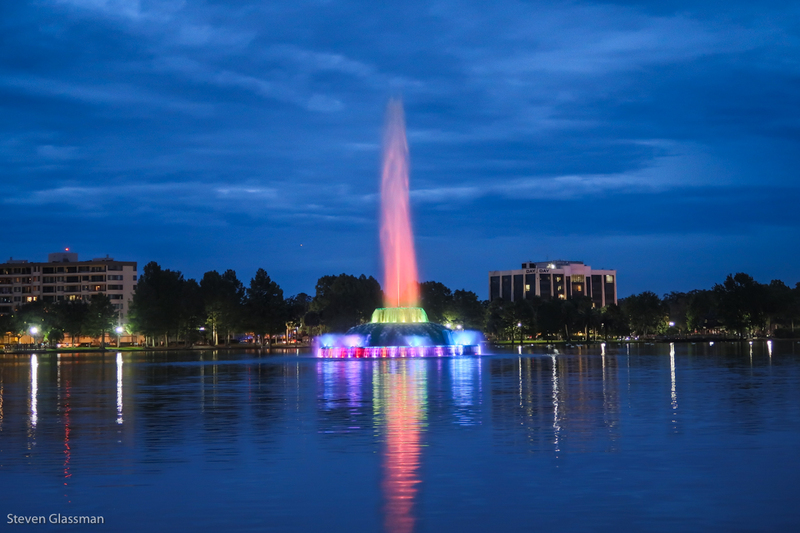 Orlando’s fountain at Lake Eola Park is the most distinctive and recognizable symbol in the city, one that is loved by our residents and enjoyed by our visitors. The water ascending from the fountain represents the continuous flow of energy and innovation that makes Orlando a city on the rise. The six equal segments on the base of the fountain embody the city’s six commission districts. The iconic fountain is surrounded by the letter “O”, which symbolizes Orlando’s unity, connectivity and timelessness. The color yellow represents the sunshine, hope and happiness that thrive in our great city. The reflection of the “O” in the water symbolizes our careful consideration of our past and our bold vision for the future. The flag is set on a two-toned background of blue and white representing patriotism, perseverance and peace. I arrived at City Hall about fifteen minutes before the celebration was scheduled to start, so I could get the lay of the land. 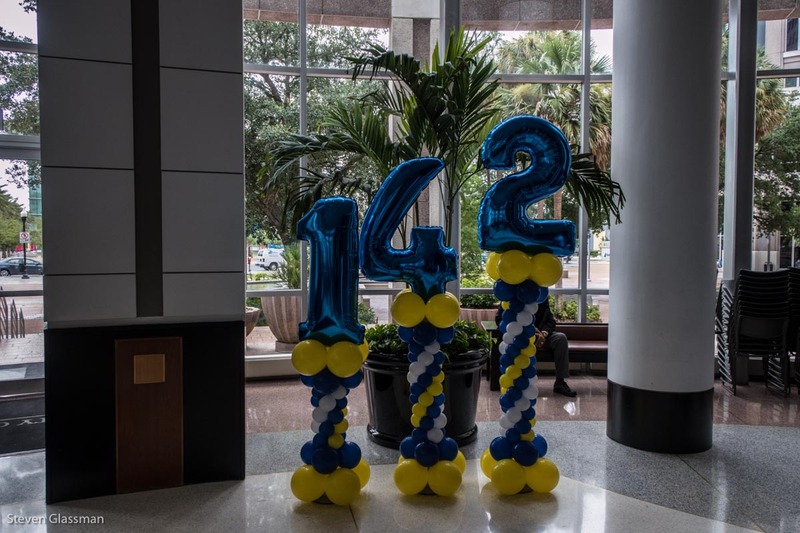 I’d never actually been inside the building before, but it was easy to find the door because the giant inflatable 142 was visible from outside. The party was held in the rotunda just inside the main doors, underneath all the flags- the US flag, the Florida flag, and the Orland city flag are all visible. 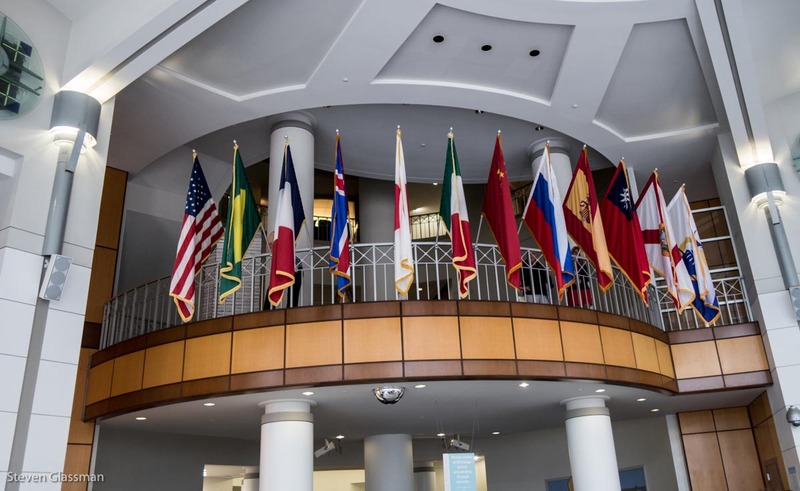 The other nine flags represent the countries of Orlando’s sister cities, I think. This party had all the fixins. 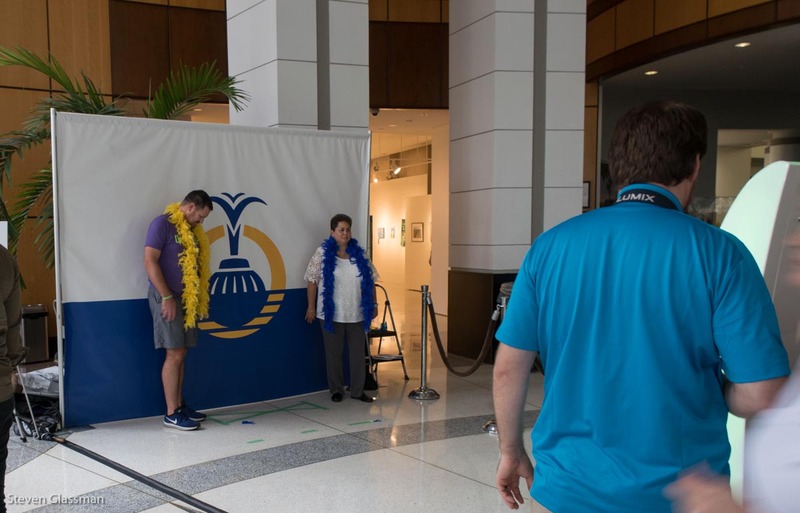 There was a photo booth for instant print pictures of you against the new flag. 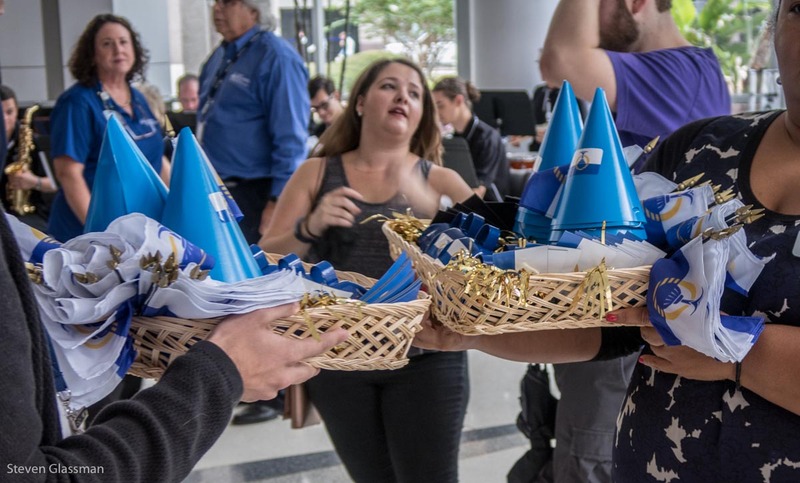 There were party hats, cowbells, fridge magnets, and tiny flags. The tiny flag is on my desk now. 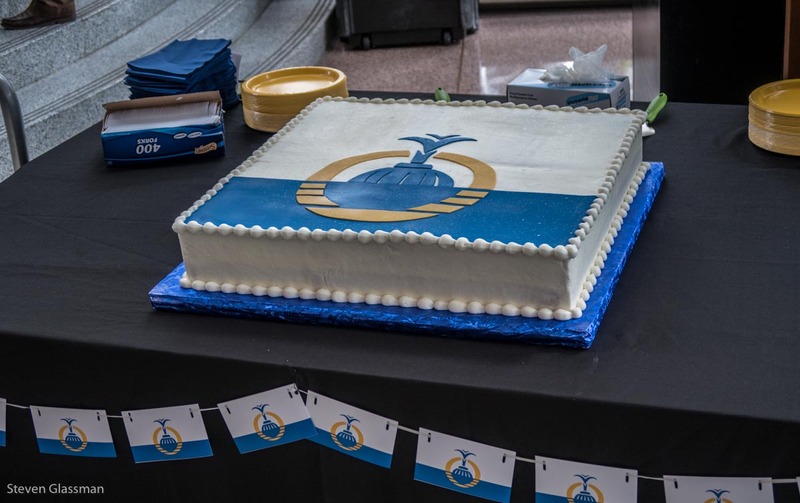 This was the city’s birthday cake. It was delicious and I rather wish I’d gone back for a second slice. There was also cookies and liquid refreshment, but I don’t have a picture of that table. 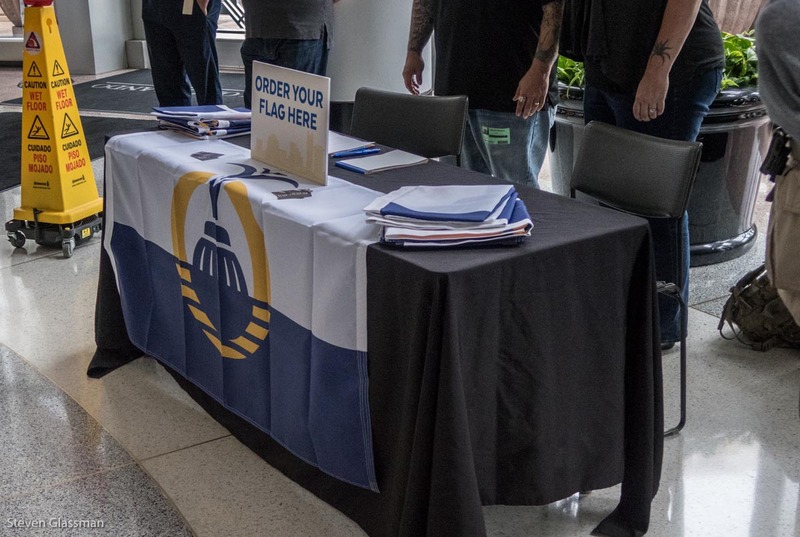 There was a table to order your own flag- I considered this for a few minutes, but decided to wait- I’m confident this flag will be available later on. 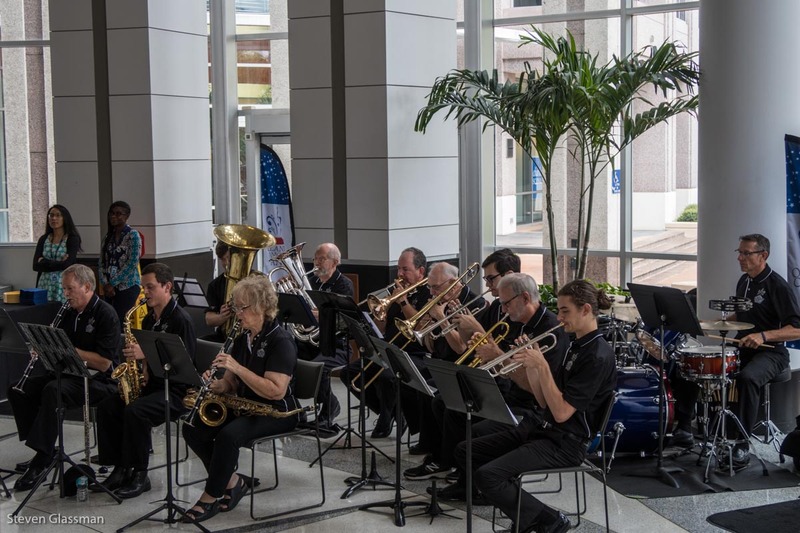 There was live music courtesy of the Orlando Concert Band. They were pretty great! This gives you a better idea of how many people were in attendance. 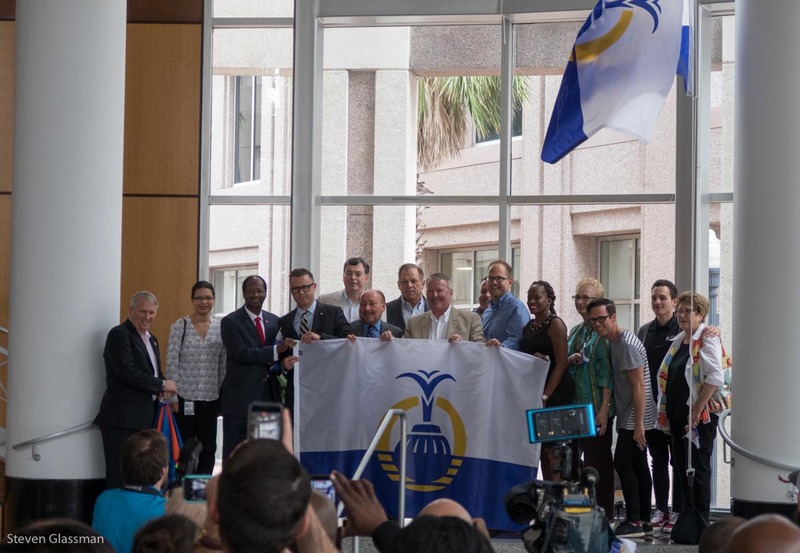 The far end of this shot is the mayor of Orlando and some officials who were there to officially raise the new flag. 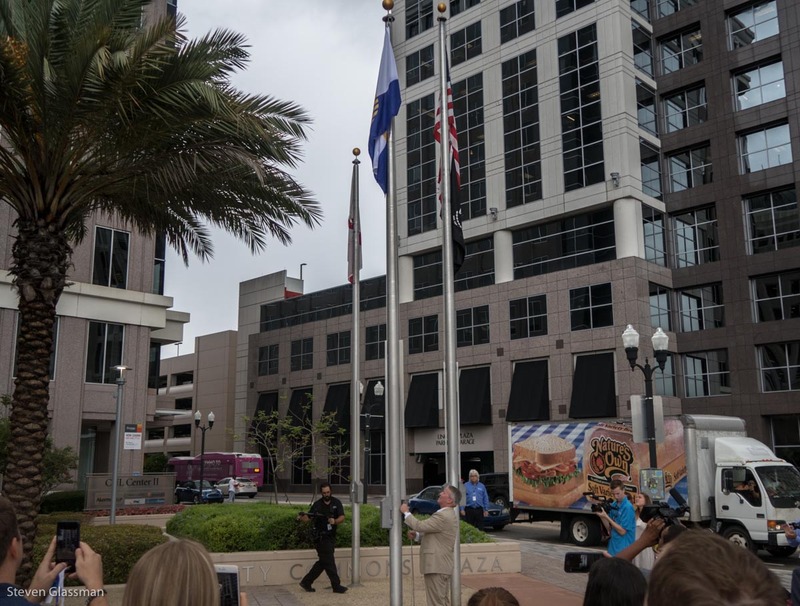 The flag raising was supposed to be outside, but Tropical Storm Emily spun up off the left coast of Florida this morning, and that forced a change. They made the best of it, though, and put a fan behind the flag to make it flap in the “breeze” after it was raised. Incidentally, the man in the beige suit is Mayor Buddy Dyer. I’ve seen him speak a few times now, and he seems like a pretty good guy. A bunch of city councilmen and other local officials posed with the flag, and that wrapped up the ceremony. But wait, there’s more! The rain was light enough that they decided to do a less formal raising of the flag outside as well. 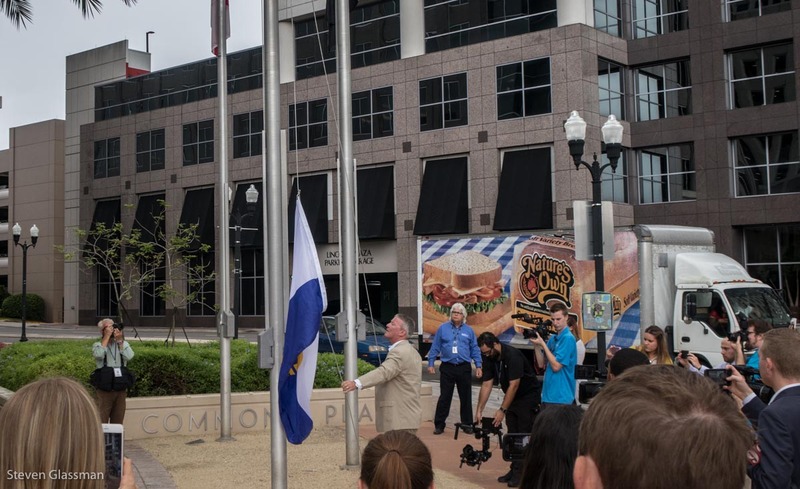 Once Mayor Dyer got the flag up to this height, he tied it off, and joked, “Ok, now everybody blow.” For a day with a tropical storm nearby, there was pretty much no wind at all. 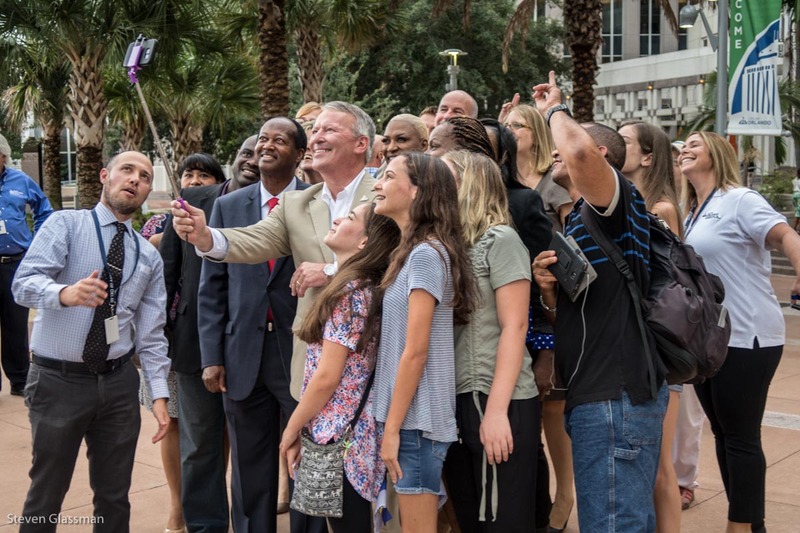 I don’t know who any of the people in this next photograph are other than the mayor, but I think this is a good example of why I like the guy- he’s approachable and friendly, and he seems to genuinely care about the people in his city. Anyone who’s game for a ridiculously large selfie is pretty OK, I think. When I lived in South Florida, I couldn’t have told you the last name of the mayor. It’s refreshing to be in a city where the mayor is so much more visibly active in what goes on with his city. The official Twitter account of the city posted this video about an hour after the event- if you look very, very, very carefully, you can spot me in there. 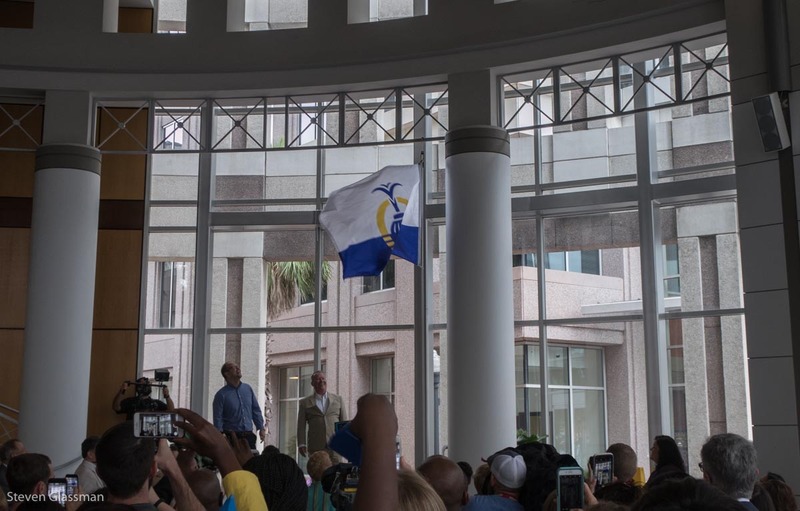 Your new #OrlandoFlag has been raised both inside and outside of City Hall. There’s also an official Flickr gallery of this event, with all kinds of high resolution photos that are significantly better than mine. 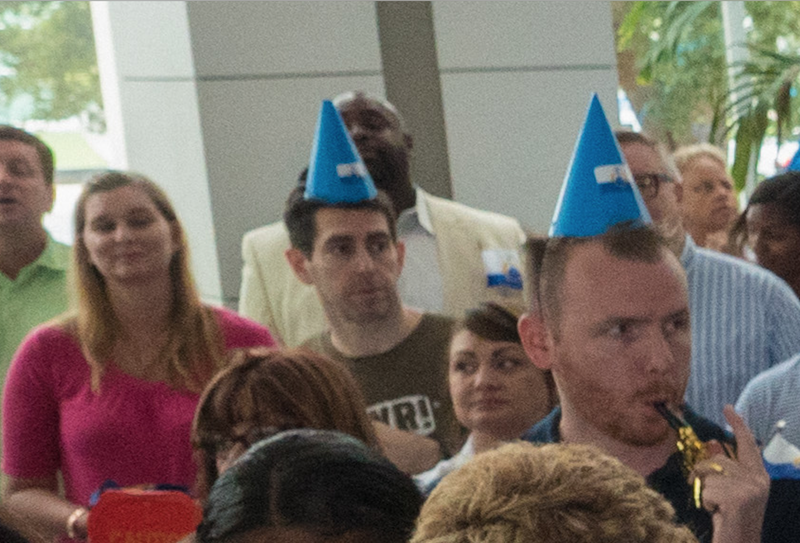 I paged through the gallery, and I found myself in only one of the crowd shots. I was trying to avoid all of the photographers, but I guess my Batman skills are a little lacking. Here’s a zoom of the one picture that tagged me. It occurs to me now that I need a proper Orlando t-shirt for stuff like this. 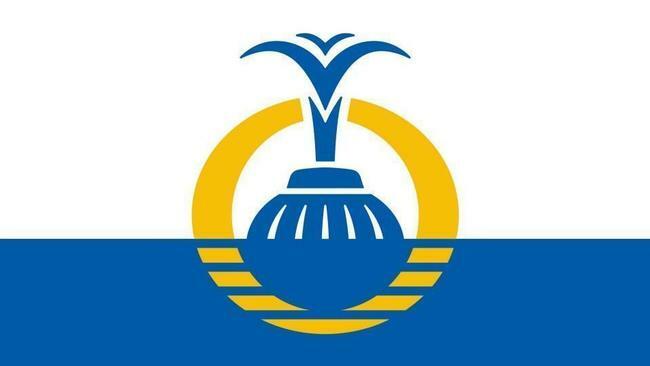 Do you like the new Orlando City flag? Since the last time I posted on the blog, I moved from South Florida up to Orlando. I meant to do a whole post about the transition up here, but this is not that post. 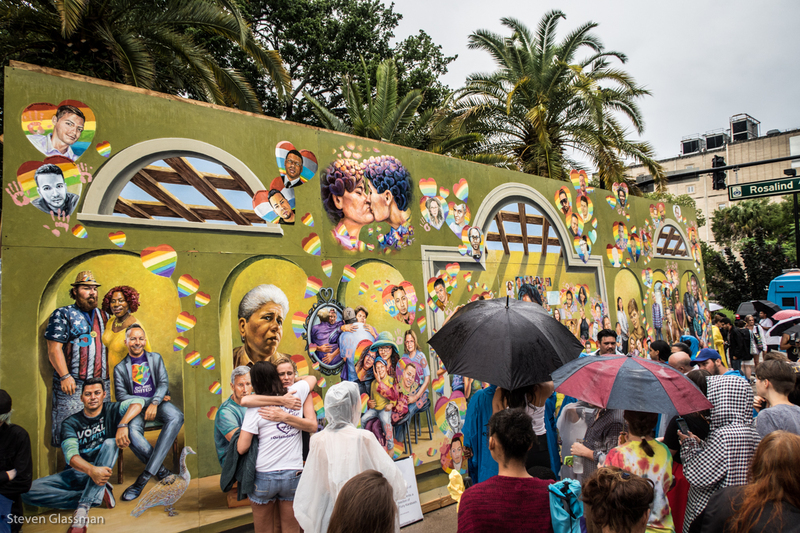 This post is about the anniversary of the Pulse Nightclub shooting. It happened one year ago today, June 12, 2016, and 49 people lost their lives, not counting the shooter. Another 58 were injured during the shooting. I didn’t live in Orlando at the time, but this city has always had a special place in my heart. 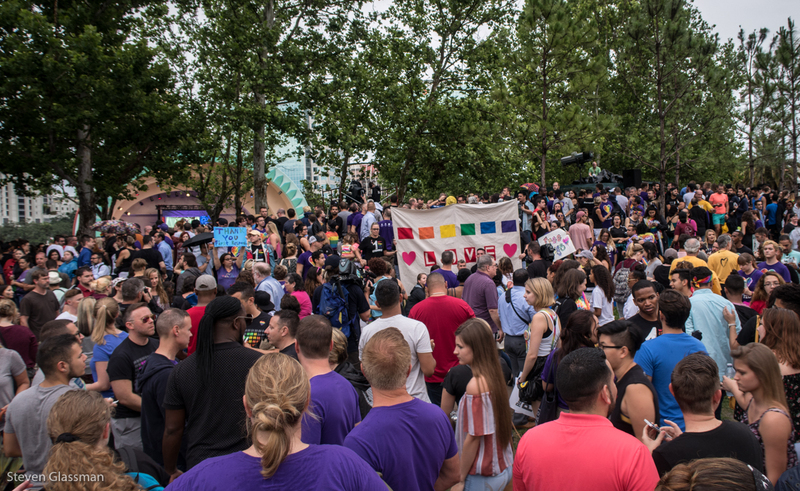 There have been vigils and remembrance events all over Orlando for the last few days, but today was the biggest set of events. Amelie and I were out running errands in the afternoon, and our route took us directly past Pulse during their afternoon ceremony. The traffic was our first clue that something was going on, followed immediately by the presence of a fleet of news vans. 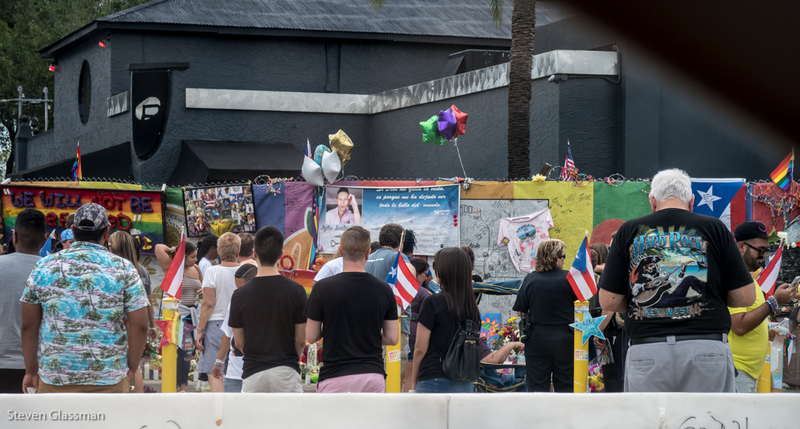 There have been people standing in front of Pulse every time we’ve driven past- the entire site is a memorial now, with a constant flow of mourners and people leaving things behind like flowers or a small token of their memory. 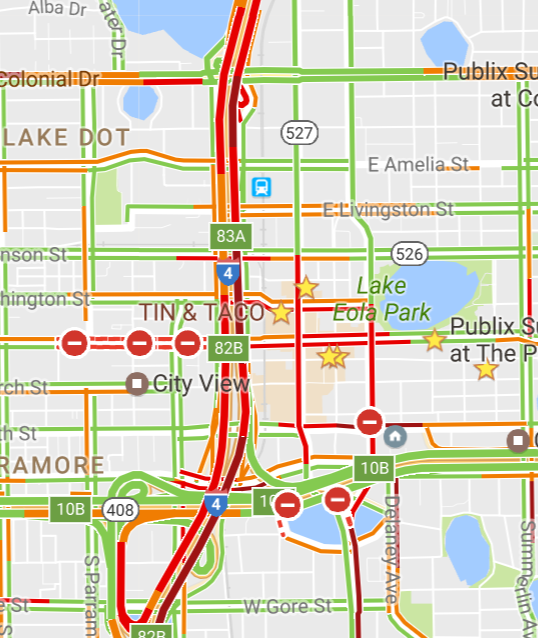 Today it was jammed, of course. On top of that, there was rain. Lots and lots of rain. 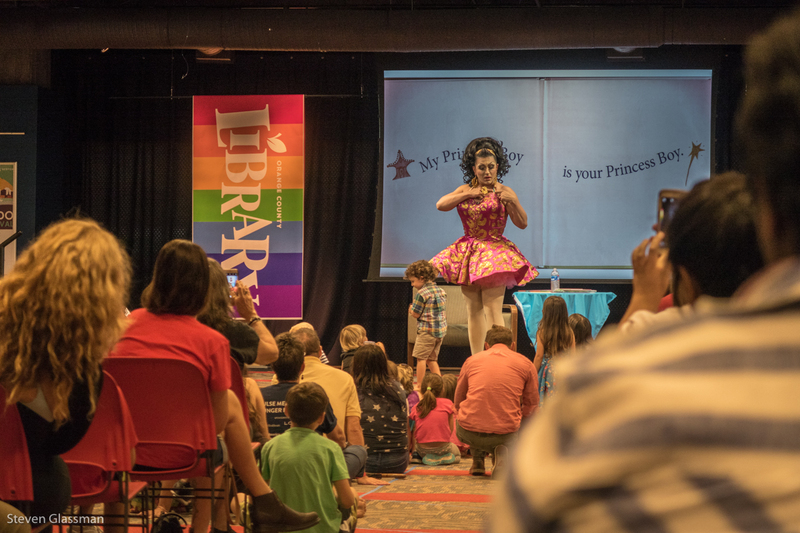 Once most of the rain leveled off, I grabbed my old MIX 105.1 umbrella and walked over to the Orlando Public Library to catch the last few minutes of Drag Queen Storytime. My timing was off; this picture was just a few moments after a spectacularly photogenic twirl by our storyteller. After Drag Queen Storyteller wrapped up, I walked the remaining block or so to Lake Eola, and wandered around the event. This mural by Yuriy Karabash and Michael Pilato was put up earlier today- I’m not sure where the mural will ultimately reside after today. You can see the top of the bandshell in this next photo- that’s as close as I was really able to get to the bandshell. 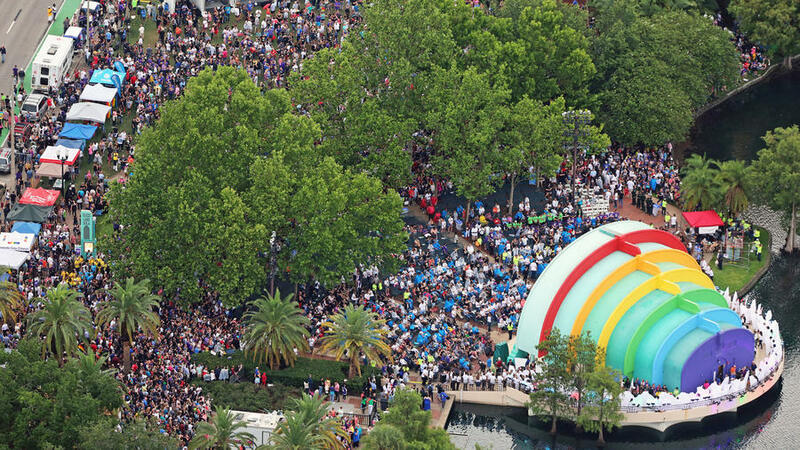 It was broadcast throughout the park over speakers all the way around the Lake, though, and Disney had put up a pair of large overflow screens so that people could watch from the larger part of Lake Eola Park on the Eastern bank. 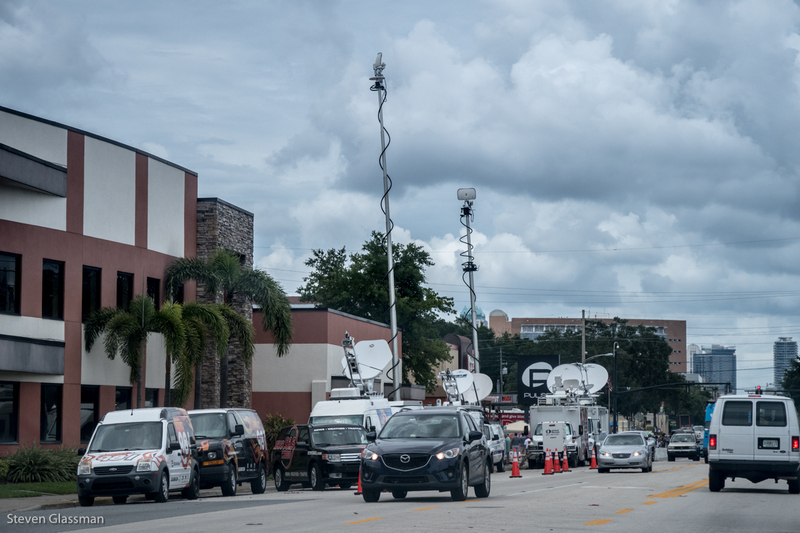 Once the event started, I could hear what was going on, but I couldn’t see it- until someone near me mentioned that some of the local news media were streaming it live, and everyone has a cell phone… I caught the video of a drum and bagpipe corps, and some other musical acts. 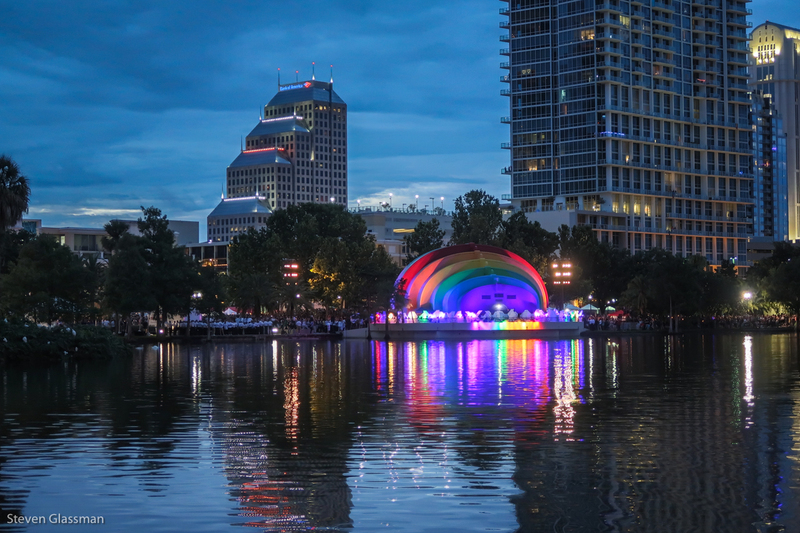 Lake Eola’s iconic fountain was also beautifully lit in rainbow colors for the occasion. It’s difficult to express exactly how something like this makes me feel- I don’t know anyone who was directly affected by the Pulse shooting, but I have such strong ties to Orlando through friends and friends of friends that I see the ripples outward. It hits especially hard because it could easily have been someone close to me. When I was twenty-five, I lived in Orlando. I was attending UCF for my degree, but in my down time, I went dancing. 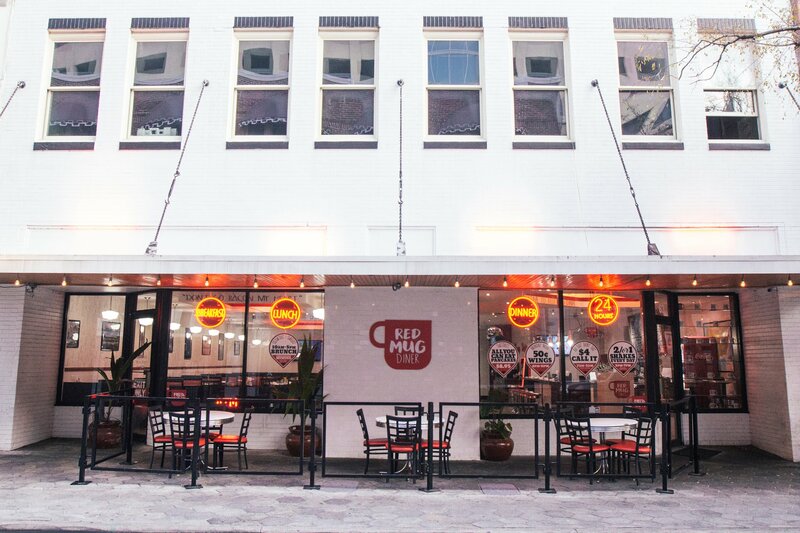 Some weeks, I would be out five nights out of seven- Two of those nights were Club Zen, Wednesdays were at the Embassy Music Hall, one night was at Barbarella or at Cairo, an Egyptian-themed club a few blocks over, or the Blue Room. Most of those clubs are gone now, but this was my circle. Except for a few cherished friends from the university, my entire social scene was based around where we could find good music. If I had lived in Orlando one year ago today, it’s possible I would have been out, dancing. I’m happy to see that one year later, Orlando is still strong, still loving, and still dancing.